Manila: Sta. Ana, Manila heritage lost to the malls too! Save Sta. Ana heritage! Sta. Ana, Manila was the seat of the Kingdom of Namayan, one of three major kingdoms that dominated the area around the upper portion of the Pasig River before the arrival of Spaniards. The Heritage Conservation Society recently visited the historic district of Sta. Ana, Manila to familiarize ourselves with the place. Sadly, several historic buildings were being torn down to give way to malls. The demolition of the Emilio Aguinaldo College, which was previously the Columban Fathers’ residence, former residence of the Franciscan Missionaries of Mary and birthplace of Student Catholic Action, is almost done. And the culprit is none other than heartless SM. This is not the first time that SM raped our cultural heritage. They had previously demolished the historic Pines Hotel in Baguio City (at the same time cutting hundreds of trees) to build SM City Baguio; the San Lazaro Hippodrome to build SM City San Lazaro; and destroyed the fabric of the Manila civic and government center with SM City Manila built right beside the City Hall of Manila, where the historic YMCA once stood. Doesn't SM know what adaptive reuse is and how developers in cities around the world use it to revitalize old districts, enhance the character of the place, increase attractiveness and business viability and protect heritage? Sadly, SM is building in a very critical area of the historic district and this will most definitely ruin the historical fabric of the place and the possibility of revitalizing Sta. Ana through tourism. Another shocker was the ongoing demolition of the Sta. 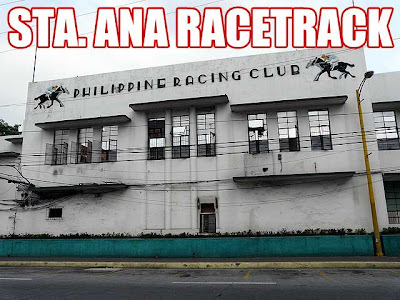 Ana Racetrack buildings designed by Architect Juan Nakpil, National Artist for Architecture. How would you feel if someone burned a painting by Vicente Manansala? Well, demolishing a masterpiece of Nakpil is similar to that! We were told another group was going to build yet another shopping mall. Do we still lack shopping malls in the country? The shells of the buildings are still there and I am hoping that they preserve these and incorporate them into the shopping mall. That will be a great example of adaptive reuse if they do that! When we visited Father James Reuter, S.J. at Xavier House also in Sta. Ana, he mentioned to us that the Jesuits plan to sell the historic property. Fr. Reuter was saddened since Xavier House is very important to the history of our country, especially during the 1986 People Power Revolution where it was a nerve center of media operations. Remember, without the radio broadcasts, there would be no People Power. This was where Fr. Reuter directed the Radyo Bandido broadcasts of June Keithley. These broadcasts are part of the Radio Broadcast of the Philippine People Power Revolution which have been incribed in the UNESCO Memory of the World, UNESCO's program aimed at preserving and disseminating valuable archive holdings and library collections worldwide. I do hope the Jesuits do not sell the property because it might just become another shopping mall. The Jesuits had previously sold their church in Padre Faura which is now Robinsons Place Manila. I hope students and faculty of the Ateneo de Manila University appeal to Father Provincial not to push through with such plans if there are any. But in the end, I am not opposed to the sale. I am against any future plans of the new owner to demolish the structure. Anyway, I'll be posting an account of our tour around historic Sta. Ana, particularly the Camarin de la Virgen in the Sta. Ana Church, a National Cultural Treasure. it's quite shocking to see how these malls just keep popping up everywhere! how many malls do we need in metro manila, anyway? Oviously you don't become a billionaire by getting all mushy about a pile of rotting wooden planks. (Presumably that's how they see Filipino architectural heritage). But then what about those who sold? What does that make them? it is sad that these are allowed to happen in this country. i wish we have a preservation society or group. Just got back from Hanoi. There's a lot to be learned about architectural re-use from the Viets. How sad that heritage buildings here have to be sacrificed for ugly malls! More and more, this sad fact hits home, that collectively we do not love our country enough to preserve our heritage. Its a cliche that becomes more and more real when one seen other Asian countries, supposedly as cash strapped as us, their cities still with that colonial gentility but in modern re-use. What more can I say?????? Not another one? It's quite frustrating being in advocacy that is not kindled by the Philippine masa...and some policy makers that do not heed to the importance of history and heritage of our ancestors. Tsk! Malls, malls...aren't there too much of it in Manila? to be honest, from the pics, the Emilio Aguinaldo College doesn't really seem to be worth saving. Joey, that's a picture of it almost demolished. Of course it doesn't seem worth saving because in the picture, it's almost gone. Last December, it was still there and the u-shaped building was still whole. Aside from it's one of the better heritage structures there, it's also historical and part of the cultural fabric of old Sta. Ana which the community wants to preserve. i agree with you ivan regarding the emilio aguinaldo college house. my sister had her pt internship there way back 1997 if i am right. anyway, i was able to go inside the house and see the beautiful wooden floors and window grills. they also had a small chapel inside the house before. the backyard was spacious with towering trees and the pasig river was just a wall away. it was well maintained then. so it is really sad for me to see that it is now demolished. The worst part about it is that they'll cut all those towering trees. And the once spacious backyard will become a congested concrete monument to commercialism and greed. As if Sta. Ana isn't as congested already. The houses being demolished seem to be right beside the old Lichauco house. Is that true? Hi Ivan! I was also at the Sta. Ana tour. Do you have old pics of the place? God bless! UNFORTUNATELY, its all been sold and demolished to date. The PRC is in CAVITE already. THIS government has NO SENSE of heritage and allows people like Henry Sy [SM owner] to buy property in the Philippines when clearly, SM is primarily a Chinese business. The government's stand is that SM's buying property generates jobs - which should be what this government should be providing people and not people like Henry Sy. Although I have no quarrel with the SM people - SM will stop buying IF NO ONE ALLOWS them to buy. Its a simple case of chicken or the egg. Only in this country that there is a mall of some kind every 1-2 kilometers of each other. So, as to losing the cultural heritage of Sta Ana - don't be surprised if a Robinsons or an SM or something else sprouts up beside Rizal's statue in Luneta. Aguinaldo's Statue is just a speck in the busy area of Tutuban... you can't even believe its there, the Hidalgo House in R. Hidalgo, Manila was also torn down [so much for preserving Felix Hidalgo's home], there's a golf course in the middle of Intramuros, and before, some people actually wanted to set up a village in at Taal.... so go figure where this government's sense of heritage is. It cannot sustain cultural heritage because it has no sincere concern to maintain and sustain it since even the head shuns the past from ever repeating itself. In this country - he/she who has the gold - rules. Thats the new "Golden Rule". Hi Ivan. I see that you're part of the Heritage Conservation Society. Maybe you guys can lobby a halt on the demolition of historical sites and request a cultural "hold order" on all sites declared a historical landmark in the country. Your group can do that right? What is happening in this Country would be unacceptable in Countries that value their cultural/architectural heritage. Pretty soon the only memories we will have of the past will be in old photographs! At least that, SM can't touch! there was a clause in the contract that they had to preserve the church. obviously, mall owner breached that contract and demolished that beautiful church! robinsons could've just made a pocket garden inside the mall with the church (similar to greenbelt). i have fond memories of that church. as a child, i used to hear mass there with my mom. The EDSA Revolution is not really worth to celebrate. The Jesuits have been occupying Xavier House since 1947, 61 years to be exact! Filipinos, Americans, Spanish, etc. have lived here. What is remarkable about this particular building is its architecture which you rarely see today. For instance, the big pillars on the ground floor, facing the Pasig River; the bathroom walls of rare-designed tiles; the tiles on the floor in the second level of the building coupled with the wooden floor panels—beautiful, wide and always shiny, possibly made of narra or mahogany. During the Martial Law years, when President Marcos called for snap elections, the NAMFREL, through Jose Concepcion, Sr., requested for volunteers to watch the polls and counting of ballots. (This was also the time when the ladies manning the computers for monitoring and counting ballots at the PICC walked out because of obvious fraudulence). Father James B. Reuter, S.J., director of the National office of Mass media based in Xavier House, an American—now an honorary Filipino citizen by decision of both Congress and Senate—and a bosom friend of the late Father de la Costa, gathered his office staff and about 95 members of the “Reuter Babies”, (the present crop of his stage actors/actresses) to help during the snap elections. Based in Xavier house, we sent the young boys and girls to the precincts wherever there was need for “watchers”. The information gathered was fed to the different radio/TV stations of the Catholic Church—The Philippine Federation of Catholic Broadcasters, also known presently as the Catholic Media Network. The snap elections, highly perceived by the people as “a strongly fraudulent election”, finally triggered the gentle people to wake up from their stupor, so to speak. After 20 years of martial rule, Marcos’ defense minister—Juan Ponce-Enrile, together with then General Fidel V. Ramos (who would also one day become president of the Philippines), together with a small rebel group, broke away from Marcos. They holed up, at first in Camp Aguinaldo (and later Camp Crame). Engaging the help of the Catholic Church, led by Jaime Cardinal L. Sin, they made known their break-away from the existing government. His Eminence, Cardinal Sin, through Radio Veritas, called on the people to join and protect Enrile and Ramos in EDSA. Listening to the radio and “feeling” this was crucial, I called up our Sisters in Tuguegarao to send Father Reuter home because something nationally vital was happening in Manila. This was Saturday night. After Mass Sunday morning, instead of joining our sisters going to EDSA, after receiving a long distance call from DYRF Cebu, one of our Catholic Radio stations, I opted to go to Xavier House in Santa Ana. As soon as I opened the door, all three telephones were ringing! I had to answer the calls, begging for patience because everyone was asking what was going on in Manila! I decided to turn on the single side-band-- our connection to all the Catholic broadcasters in Luzon, Visayas and Mindanao: the Philippine Federation of Catholic Broadcasters. All our radio stations were on, clamoring for information! I asked them to be patient because I was literally alone. I spoke in English, Cebuano, Ilonggo and Tagalog; I could not answer in Ilocano but luckily, the manager of our station there was an American. Father Reuter finally arrived early afternoon and asked: “What now?” I informed him that I had called up 10 boys from among his stage actors and 2 of my cousins. After a late lunch, Father Reuter gathered us for a meeting. He mobilized everyone: June Keithley Castro, accompanied by 15 yr old Paulo Mercado and his 13 yr old brother, to go on the air at Radio Veritas. The rest of the boys were deployed in Santolan, Libis, the length of EDSA, the “war room” of Enrile and Ramos in Camp Crame, Nagtahan bridge and Paco areas. As soon as June’s voice was heard on the radios in EDSA, it was electric—cheers, rejoicing, etc! I was assigned the code name “Lady in White” to man the telephones and the single-sideband here at Xavier House, giving information to all our radio stations. We had to use code names over the single sideband. The rest of the “Reuter Babies”, using their stage-code names were only armed with walkie-talkies, their only means of communications with me. BUT Marcos’ forces had destroyed all the transmitters of Radio Veritas in Bulacan. Radio Veritas continued to broadcast briefly with a small semi-transmitter in Commonwealth Avenue, but eventually had to unhook. Crucial decisions followed. Cardinal Sin called up Father Reuter. Cristina Ponce-Enrile called up Father Reuter. Once again, an emergency meeting took place here in this historic, unobtrusive house: June Keithley and the Mercado brothers, together with the rest of the Reuter Babies were in attendance. During the meeting, I remembered Major Ruben Ciron, whom I had met at the Kapisanan ng Mga Broadcasters meetings. He was the manager of the Jacinto’s radio station which had been confiscated by Marcos. He was also the senior aide of Johnny Ponce Enrile. I suggested to Father Reuter to contact Enrile, which he did. Major Ciron, in civilian clothes, went to DZRJ, housed at the Communications Foundation for Asia building on Sta. Mesa, quite close to Malacaňang! He moved the crystal and changed the frequency which was very close to the frequency of Radio Veritas. We named DZRJ “Radyo Bandido”, as suggested by one of the Reuter Babies. Father Reuter sent June, together with Paolo and Gabe to “Radyo Bandido”. The rest of the boys went back to their previous assignments, armed once again with only single hand-held radios. I stayed on at Xavier House. When June’s voice came back on the air over “Radyo Bandido” on Sta. Mesa everyone thought she was still broadcasting from Radio Veritas on Commonwealth Avenue. Meantime the Reuter Babies would call: “Lady in White, we need people in Santolan!” “Lady in White, we need people in Libis!” “Lady in White, tell June there are tanks moving into EDSA...” etc. These messages would come into Xavier House, I would relay the information to June, and June would broadcast it over “Radyo Bandido” and the people in EDSA would respond! Even the American Embassy depended on our information. We were in constant communication with the political section of the U.S. Embassy. This continued until Marcos and his family left for Hawaii. If these events do not make this beautiful and “antique” house, historically significant and worthy of its noble heritage, what will??? Thanks for forwarding the petition. The Province Staff has received several copies of the petition already. We understand the goodwill of the petitioners and recognize the historical value of Xavier House. However, the Province is facing difficult financial challenges. Even before the current economic meltdown, Province Funds have been excessively strained. The ongoing crisis has only made an already difficult situation much worse. Hence, the decision the sell some of our properties, including Xavier House. You are right in saying that we are going through a very deliberate and thorough process on these major issues and at arriving at significant decisions. In particular, the Xavier House community went through a discernment process. While the decision to sell Xavier House has been difficult to accept especially by the long-time residents of the house, Fr. Jojo and the Province Staff have been very appreciated of the Jesuit spirit of cooperation that the Xavier House community has shown. Thank you for helping us explain the situation to any concerned alumni. nakakalungkot isipin na dahil lamang sa komersiyalismo,ang makasaysayang Sta Ana Maynila ay matatabunan ng mga malls. sapagkat dito sa simbahan ng Sta ikinasal ang aking mga magulang,dito ako bininyagan, at dito rin nagmula ang aking pangalan sapagkat piyesta ng Sta Ana ang araw ng aking kapanganakan. Alam ko na dito rin ako maglilingkod sa darating na panahon.Ipapanalangin ko sa Nuestra Senora de Desamparados na hindi ito mangyayari. Do you have an exact location for the building. Would it be possible for you to mark it on Google Map Maker? Yes, it's somewhere between the Sta. Ana Market and O.B. Montessori. I don´t think you should blame the buyer for destroying our heritage. You should blame the seller. 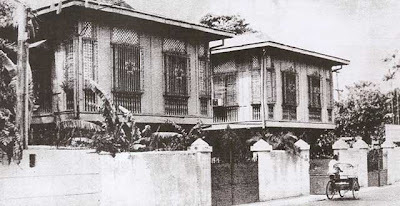 If the Jesuits do not feel that Xavier House is worth preserving, then it´s their fault if it gets demolished, not Henry Sy. Not too fast. Henry Sy is most definitely part of the problem when they pressure these owners to sell their properties. I'm not talking about Xavier House. I'm talking about the other structures they demolished to build malls and supermarkets. They are both part of the problem. And if indeed Henry Sy loves this country, he too will find a solution. In its issue of 31 March 2009, the Philippine Daily Inquirer (PDI) ran a front page article on the ‘sale’ of Xavier House that demands some clarifications, not only because of its misstatements of fact but also on account of the innuendoes and implications it fosters. 1. The article falsely claims that a done deal has been made between the Philippine Province of the Society of Jesus and the SM Group for the purchase of the Xavier House property. The Provincial and Province Treasurer are quoted as denying this; but a source from the SM Group (conveniently left unnamed) is produced to state the contrary. In no uncertain terms the article adopts the latter as the correct version. This is not true. The Province has had no contact with the SM Group, has not even gotten to the point of putting the Xavier House property up for sale. 2. The PDI article also tends to misrepresent the whole issue as if it were nothing more than a money-making scheme. It brushes aside the reality that the Province is in real financial straits, exacerbated by the ongoing world financial crisis. The rising costs of medical care for our senior and infirm Jesuits and formation for our younger men have taken a toll on province resources. These resources are dedicated to almost a third of Philippine Jesuits who are in formation, and an even bigger group of some 110 who are over 70 years of age, 61 of whom are 80 and above. Along with this, the Province also has to support other works that are not self-sufficient. It is unfortunate that people do not realize that the Province is not Ateneo de Manila or Xavier School, and that funds do not come out of one big pot that is commonly shared. 3. Fr. James Reuter, with whom I spoke this morning, is very much dismayed at and disturbed by the PDI article. He lamented the distortions it presented and the picture of him and of the Jesuits that the article unfairly painted. Father Reuter continues to affirm that the Society of Jesus he entered almost seventy-five years ago has always cared for him and will continue to do so to the end. He well knows that despite all difficulties, the Philippine Province remains committed to make sure that all our Jesuits in our different communities are provided for and attended to. JOSE C. J. MAGADIA, S.J. There is a petition website asking the Jesuits to let Fr. Reuter stay at Xavier House. I hope they reconsider and let him die at the comfort of his home with dignity and honor. We dont even know if the Jesuits have acknowledged that there is a petition going on. We have notified them but no response back. Money is not the problem... it's actually the solution. It's not Henry Sy's fault that he can afford to buy properties and build establishments, but it is always nice to "moderate one's greed." Xavier House has witnessed a lifetime. If saving it for the sake of heritage and history is not worth it, then I pray that the Jesuits will fight for it for the sake of those occupying it. It's really depressing to see the historic and beautiful Sta.Ana, Manila heritage lost to these structures. So much has been commercialized on these place. Anyway, hope yo're here on May 12 to be part of the feastday of Nuestra Sra. Desamparados, patronness of Sta. Ana. I'll keep that date in mind. What time is the procession? I grew up in this area of Manila, thus, it is so dear to my heart. I even had my first confession in Xavier House. The school that I have attended to is seated beside this sanctuary. Montessori and Jesuits collaborated for our First Communion. Back then, EAC didn't look that way, it was a decent building where I usually see nurses. I don't now if it's allowed but Montessori's building can be a good tour. It does look like a Spanish Mansion. The fountain at the middle of the garden, the stable-like structure of the clinic, and the ventanas that are situated at the bottom of the walls, it all shouts history. Around the streets of Syquia and nearby alleys you'll see a lot of homes with spanish-influenced architecture. I even know a friend who owns one. You may also take a look at Concordia College which is within the area. It's one of the oldest schools in the country, I think its now 140 years old. Jose Rizal's sisters and girlfriend were a student of that school.Food trip can also be good here, Beth's palabok and Herran Bakery are one of the best. With the so-called renovation of Sta. Ana, the city of Manila is literally losing its soul not to progress but commercialism. 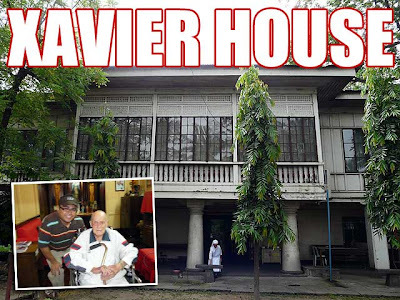 I also hope and pray that the Jesuits will not sell the Xavier House. and, yes, i agree with you Pam that even if these rich people can afford to buy properties, the should know how to "MODERATE THEIR GREED". Masyado na silang naging alipin ng kanilang salapi. I hope the Xavier House is spared from this sale. I also pray that God would come to intervene and provide them with financial solutions so they would not look at selling the property as an option. I hope Fr. Reuter and the others do not lose this house, I hope we the Filipinos maintain such a historic part of our "bayan". Pray my dear friends...God still makes miracles! First, we can blame that to the previous City Mayor. He should convinced the present owner of the property not to sell or help him in case there's a problem in a Realty Tax. Second, if the owner wants to give up the property, better else the local city buy it and make it as a museum or tourist attraction. It might help our local folks for some jobs. SM is good of getting an advantage in this. 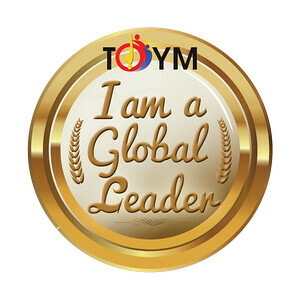 I used to have a partnership with SM and thought of a privilege having them, but it turns out my worst nightmare. Our area will be a bad place if they will put a mall. There's the public market, schools and church. The streets might not be able to handle the heavy volume of vehicles and pedestrian occupying the street. Whoever had an idea on this have definitely need a surgeon for "Brain Sprain." Good post Ivan. I visited the site on Saturday and it is all gone, the lovely old grandstand, the other buildings, everything. While it is perhaps not that surprising that a huge site like Sanata Ana in the center of town should come under pressure from developers, as you said, surely some thought could have gone into adapting the existing buildings, rather than obliterating them? 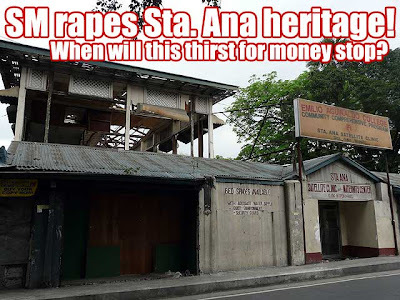 i am from sta ana, and have lived there for more than 20yrs. it really is heartbreaking to see the families investing in a small business in the public market, just to find out that they will be competing with the giants, as the SM Savemore recently opened in sta ana.